FirstLink Communications Inc., offers our customers a wide range of services covering all of our customer’s voice and data communication needs. Our expertise spans across commercial, industrial, governmental, healthcare and high-tech construction. 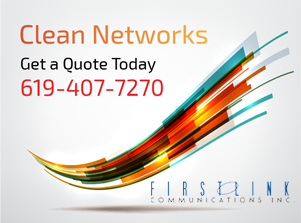 FirstLink Communications Inc., offerings include a 24-hour service department, design-build and pre-construction services, special projects and tenant improvement services, special projects and tenant improvement services and a data communications network services division. Our effective processes allow us to successfully participate in all areas of data communication cabling. At FirstLink Communications Inc., we carry a comprehensive assortment of telecommunications applications that can enhance your business productivity. Whether you are interested in network cabling infrastructure, server / MFR / IDF room build outs, network services, wireless installation, overhead paging, sound masking, or RF distribution. We can put our experience to work for you.